Before Christmas, Gerry's Fresh Foods next door kindly sponsored a Christmas Tree Decoration Competition with all proceeds from the tree going to help the brilliant work done by Drogheda Boyne Fisherman's Rescue. The standard was extremely high and it was very difficult to pick a winner. That task fell to some of the Boyne Fisherman's Rescue team and the staff of Gerry's Shop. After much deliberation they finally settled on six prize winners (pictured). As part of the winners' prize they got the opportunity to visit the Boyne Fisherman's Rescue boathouse on the Marsh Road. They were given a tour of the boathouse, tried on life jackets, sat in their jeep and played with the sirens but undoubtably the highlight of the trip was being brought out on a boat on the River Boyne. Each child even got the opportunity to drive the boat! That wasn't the end of the surprises either as the 'crew' were then taken back to Gerry's shop where they received lots of treats and a further prize. 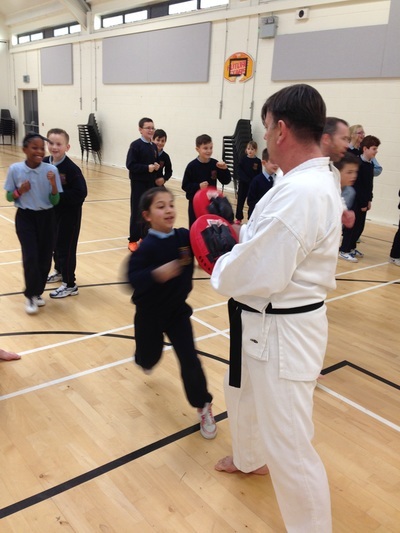 SMPPS would like to thank Gerry, Martina and all the staff in Gerry's Fresh Food for their continued support. Also, a big thank you to Boyne Fisherman's Rescue for taking the time to accommodate our students. The town is very lucky to have such a wonderful group to call upon. Friendship week is a week when we do all sorts of fun activities based on friendship. 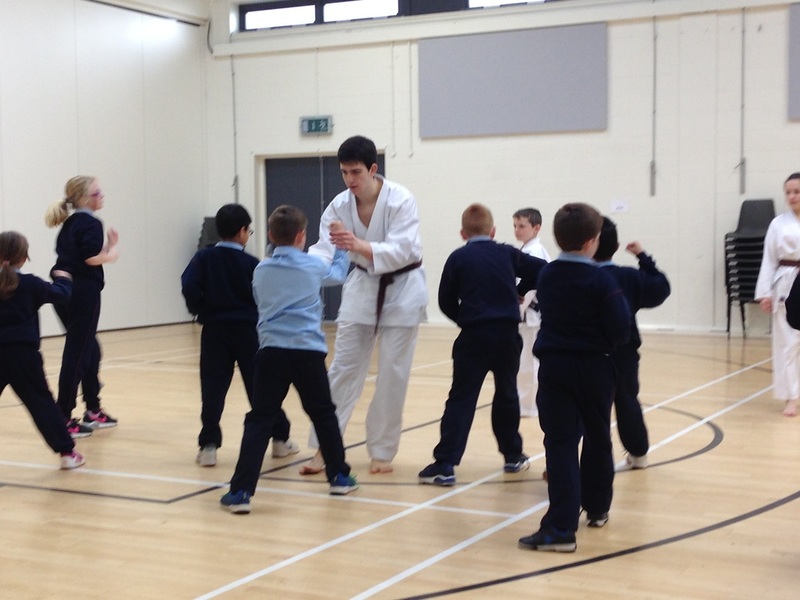 Some activities include: a friendship cafe; anti bullying lessons; new playground games; friendship songs; making friendship posters with a slogan, making friendship bracelets, writing friendship letters to one another, complimenting our friends, discussions on how to be a better friend and being a secret friend to someone in your class. At the end of the friendship week, we had a fun assembly with many classes participating. 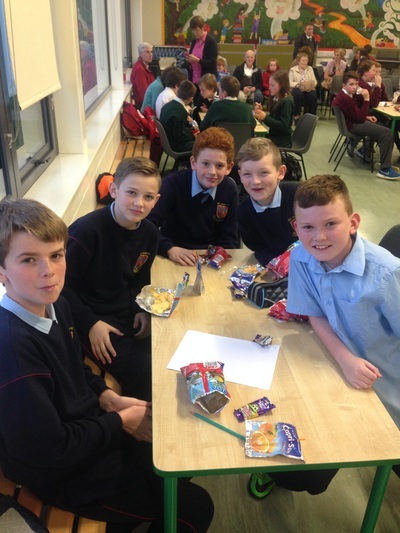 Before Christmas, for friendship week, some classes participated in a friendship cafe. The idea of the friendship cafe is that we mixed up the classes (from our age groups) to make new friends and to learn more about each other, (whilst we are eating our lunches.) 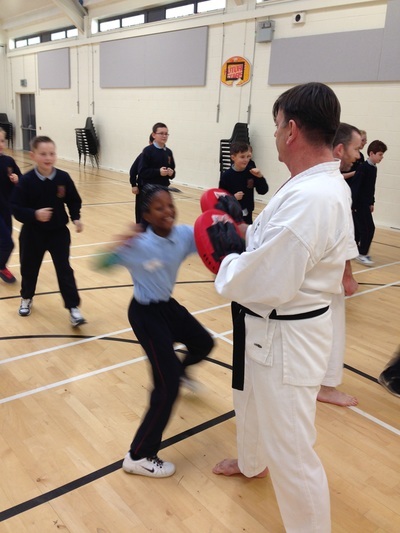 For 6th class, the idea was to make new friends who might be going to our secondary school. We created friendship posters with a slogan for a competition. All classes took part in anti bullying lessons too. 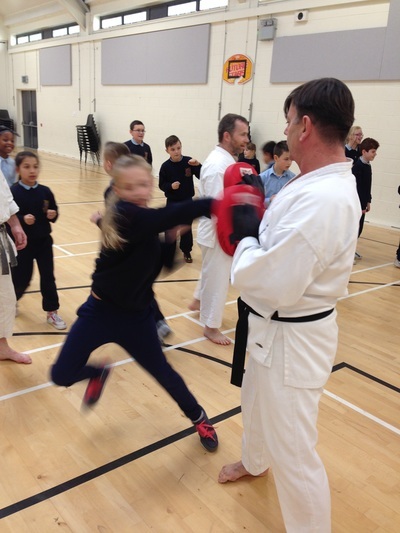 The main messages in these lessons were: identifying what bullying behaviour looks like (an action which is unwanted, deliberate and also repeated); coping with bullies; safety in numbers; how to get help. We also learned how to solve problems between friends. Our class (Ms. Power's 6th Class) drew a smiley face on a page, scrunched it up, stood on it, then we opened it out and tried to flatten it out straight, and then we apologised for hurting the smiley face. This activity showed us that you can't undo what you did or said, even when you say sorry, the hurt can still remain after the apology. We know now that we should think before we speak. On the last day of Friendship Week, we held a friendship assembly. We sang songs such as “You've Got a Friend in Me” and “Count on Me”. Some classes read out poetry which they created and sang raps and other songs. Everyone wore yellow to represent friendship. 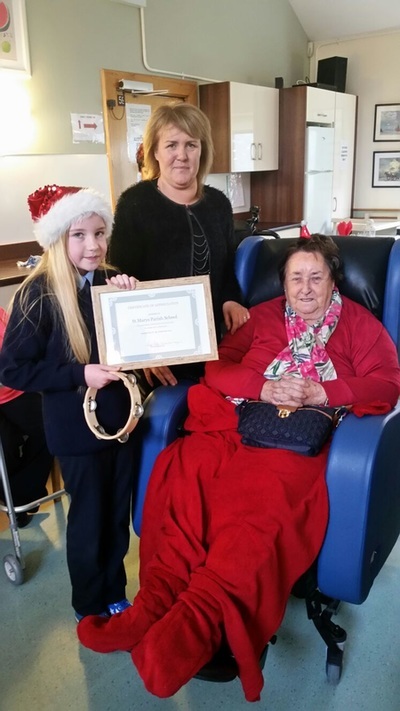 Marie, Matilda and Margaret each received friendship certificates for always being kind, friendly and helpful to everyone throughout the years in SMPPS. The aim of friendship week is to teach everyone how to be a good friend and how to make new friends. Santa stops by to say Hello! 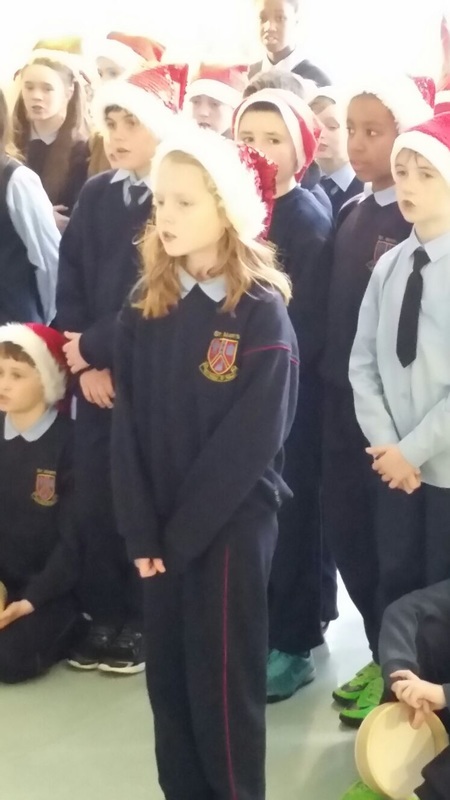 There was a special visitor to the school just before the holidays. Although he was very busy preparing to leave the North Pole on Christmas Eve, Santa took time out to visit SMPPS and deliver some greatly appreciated goodies! The big man seemed to know where all the children lived and what they were getting for Christmas without having to be asked. 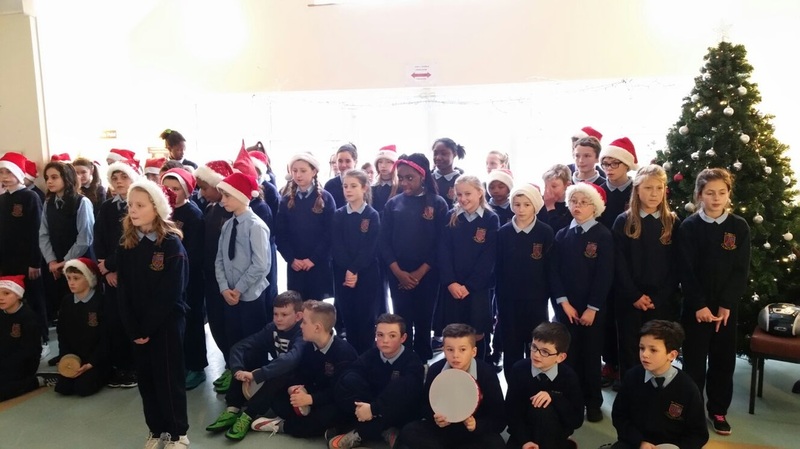 He also recalled visiting some of the teachers when they were younger in their homes around Drogheda, Galway, Kerry and Longford. He even recognised Father Phil who he visited in Mullingar a long, long time ago!! 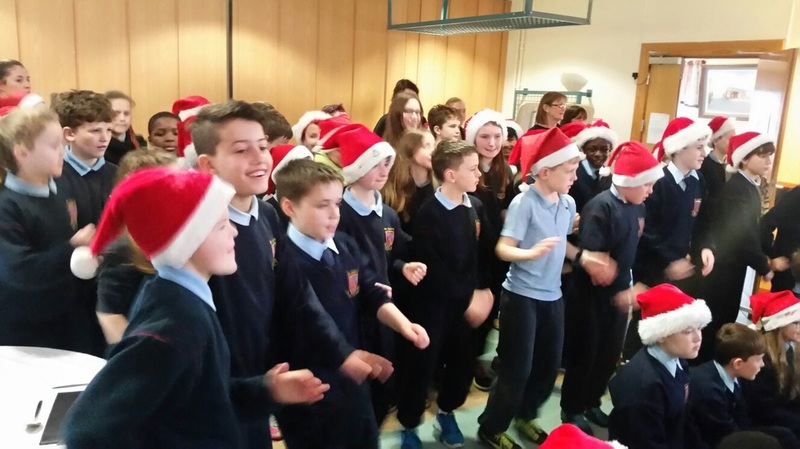 Here are some photos of Santa's visit! 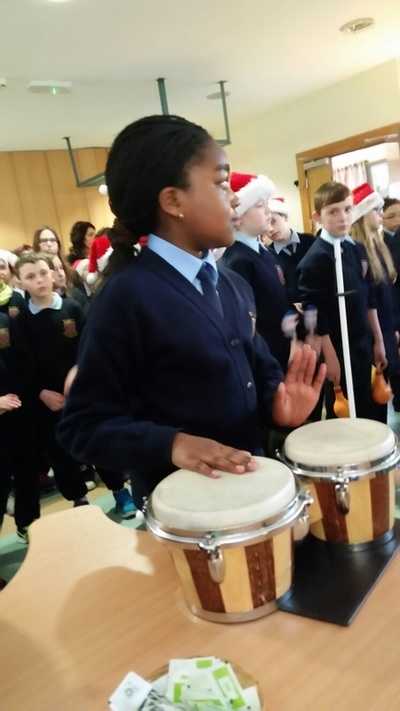 Christmas is always considered a time of giving and this year that was nowhere more evident than St. Mary's Parish Primary School. Please read our articles below which give information about 5th classes' visit to St. Mary's Hospital to sing carols, the choir's contribution to Gerry's Fresh Foods customer appreciation night, our Drogheda Homeless Aid Coin Appeal and also our St. Vincent de Paul Toy Appeal. Well done to all the students and staff for their kindness and genorosity. 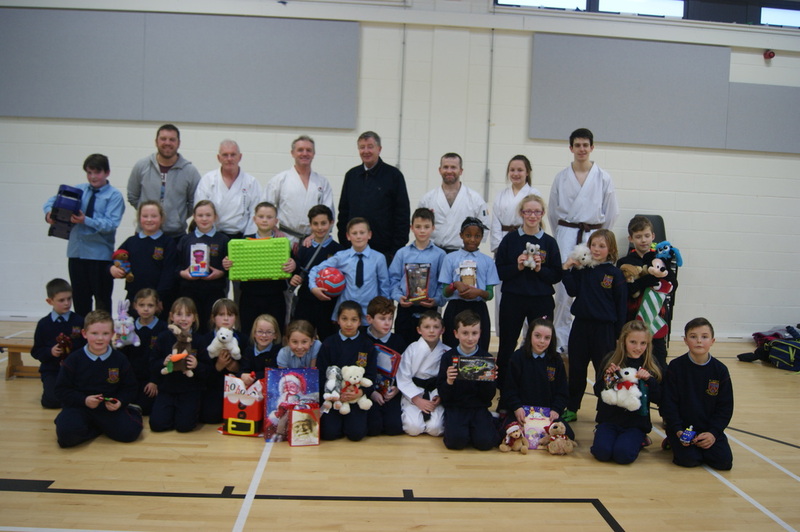 Our now annual St, Vincent de Paul Toy Appeal proved to be a wonderful initative again this year. Each year the students are asked to donate any unwanted or unused toys they have at home that are in good condition. These are then given to children in the local area who may not receive as many gifts at Christmas time. 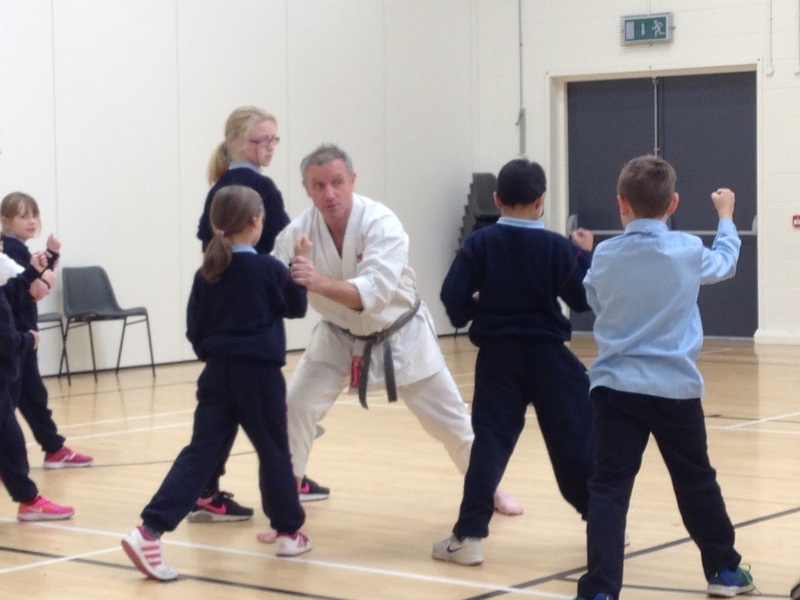 In exchange for these toys local SVdP volunteer Philip Smith and his team at WIKF (Wado International Karate Federation) Drogheda give up their free time for two whole days to teach and demonstrate karate to the pupils of 1st-6th. 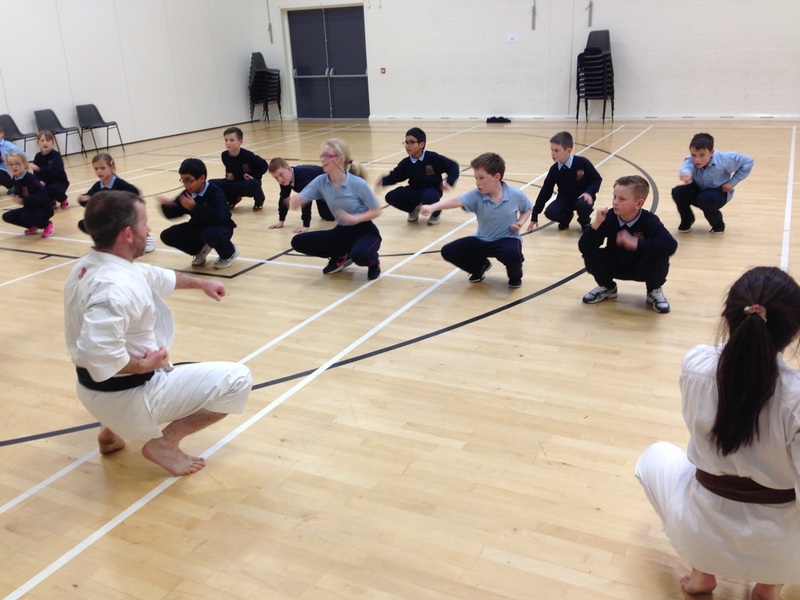 This is a wonderful exercise and one enjoyed by all the students. 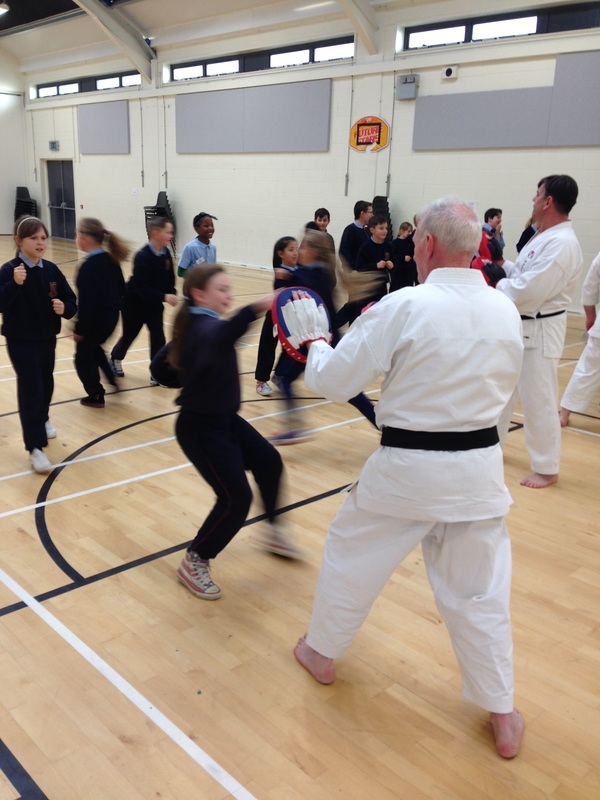 The school would like to thank Phil and his team for all their efforts and also Joe Sweeney of St. Vincent de Paul, Drogheda for popping in and having a chat with some of the classes. If you are interested in getting your child involved in Karate, classes run each Saturday from 11am - 12 midday at Aura Leisure Centre for children 6 years and up. All welcome! Christmas is a time for giving and that was quite evident in SMPPS! 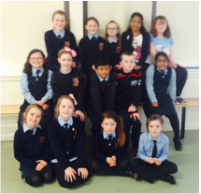 The pupils along with their parents were asked to send in any unwanted coins that were gathering dust at home. These would then be weighed and counted with all proceeds going to Drogheda Homeless Aid. Searches began down the side of couches, under the seats of cars and along shop fronts. However, nobody could have foreseen the amount of money that was to be raised in total. Altogether the pupils collected 416.3 kg of coin. When counted this amounted to a whopping €4975.77 which all when to Drogheda Homeless Aid to help with the great work that they do. 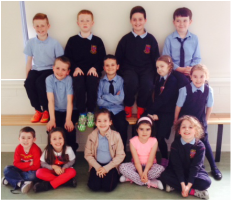 Well done to Ms. Hunt's 1st class who gathered the most coins for one class – 27.3kg! Two other classes (Ms. Lambe's 2nd & Ms. Hanratty's 5th) also collected over 20kg each. 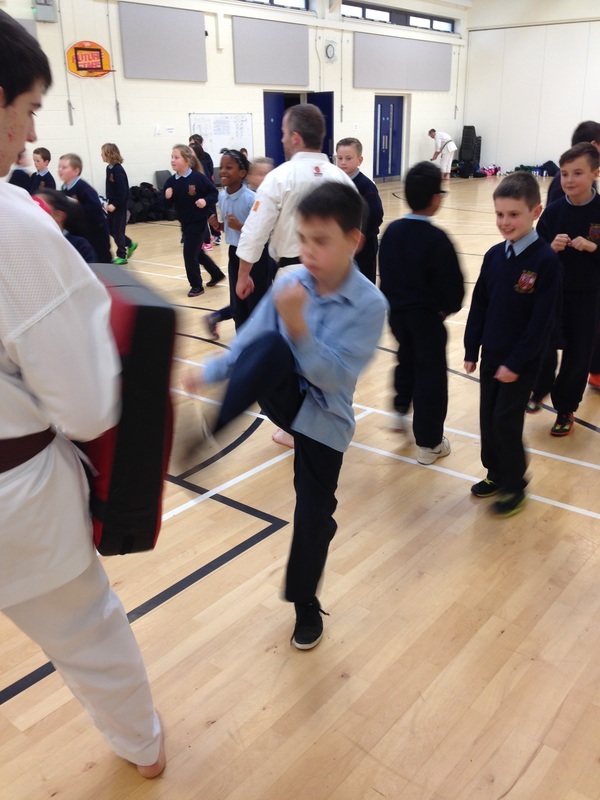 The year group that collected the most was 1st class who collected a staggering 66.7kg between them! 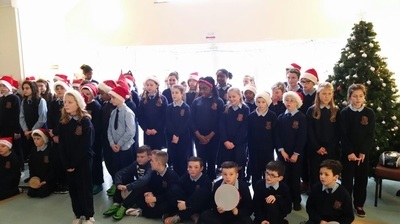 This was a wonderful team effort but special mention must go to Jimmy in Gerry's Fresh Foods who counted a lot of the money for the school and also Ms.Dolan who organised the whole collection. Sometimes the simplest ideas are the best ideas! 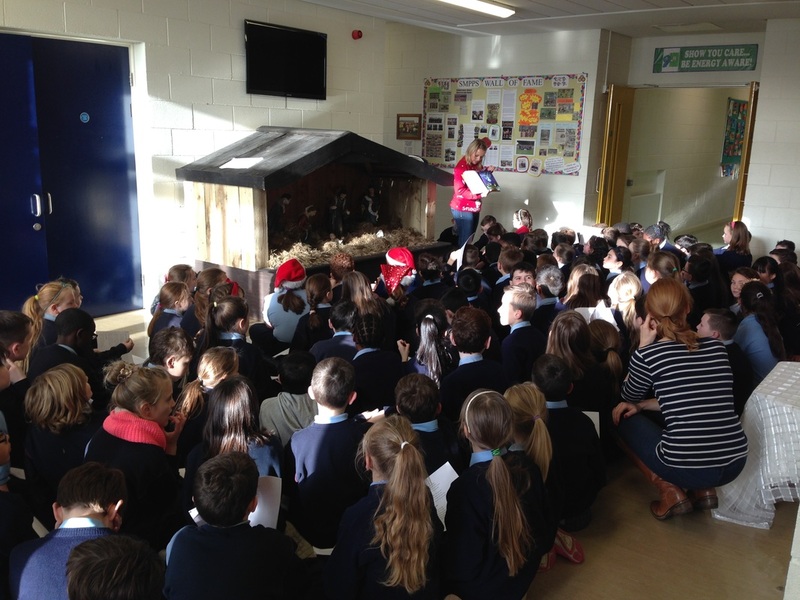 After a busy 1st term and the hustle and bustle of Christmas on the horizon, 4th class decided to take time out and chill by the crib. There they listened to the Christmas Story and sang some christmas carols together. They gave thanks for all the good things that had happened throughout the year and had a special thought for all those people for whom Christmas is a difficult time. This was a lovely gathering and a lovely way to finish off 2015. 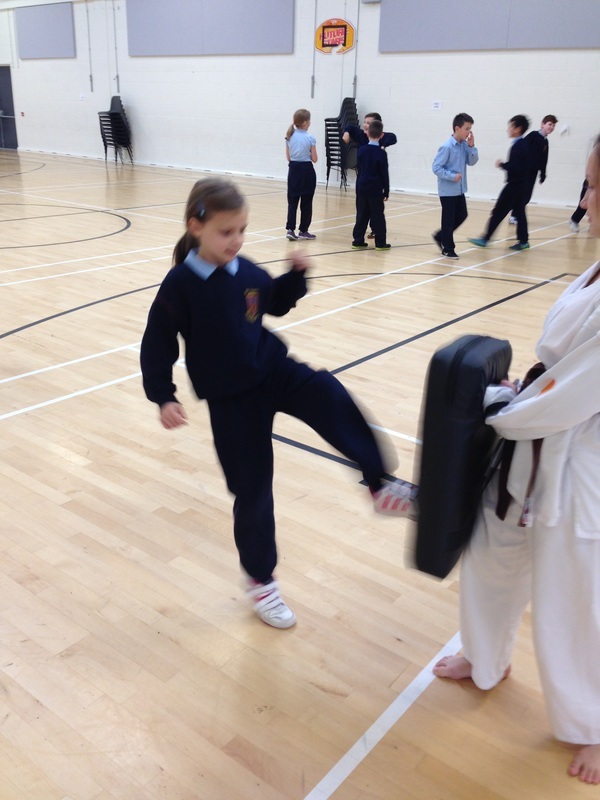 Thank you and well done to Ms.McKenna who came up with the idea and organised it also. 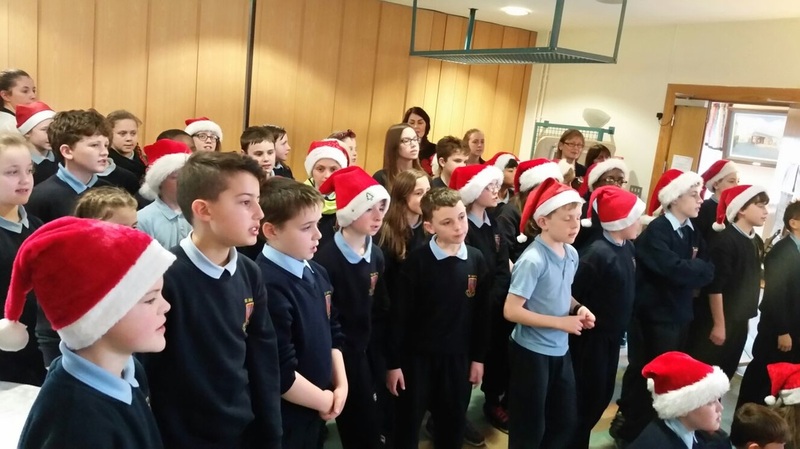 Choir Perform Christmas Carols in Gerry's! 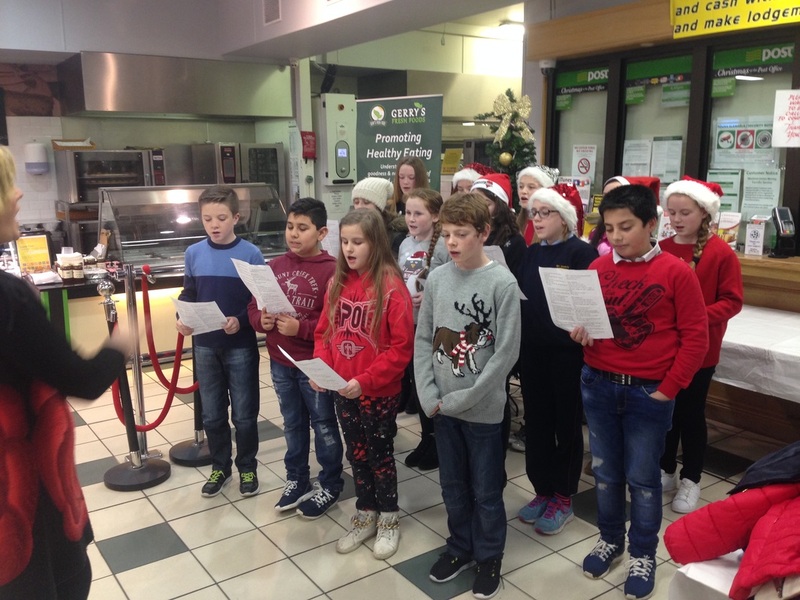 Christmas is the time of giving and to thank Gerry's Fresh Foods for their continued support and sponsoring a Christmas Tree Decoration Competition our choir sang a number of carols in the shop for their customer appreciation night. The group (wonderfully led by Ms.White) really kicked started the festive season and those in attendance commented how well they performed. 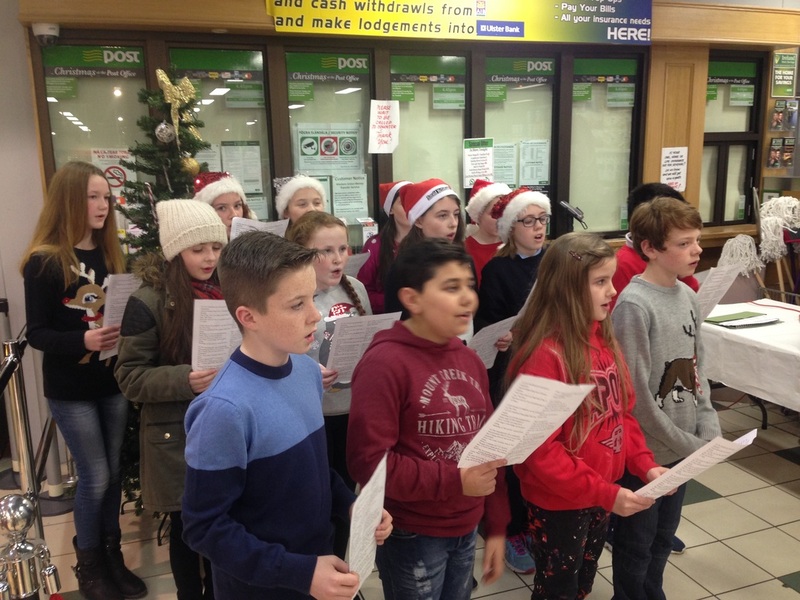 The customers were treated to songs like Little Drummer Boy, Walking in a Winter Wonderland, Silent Night and of course We Wish You a Merry Chrsitmas. 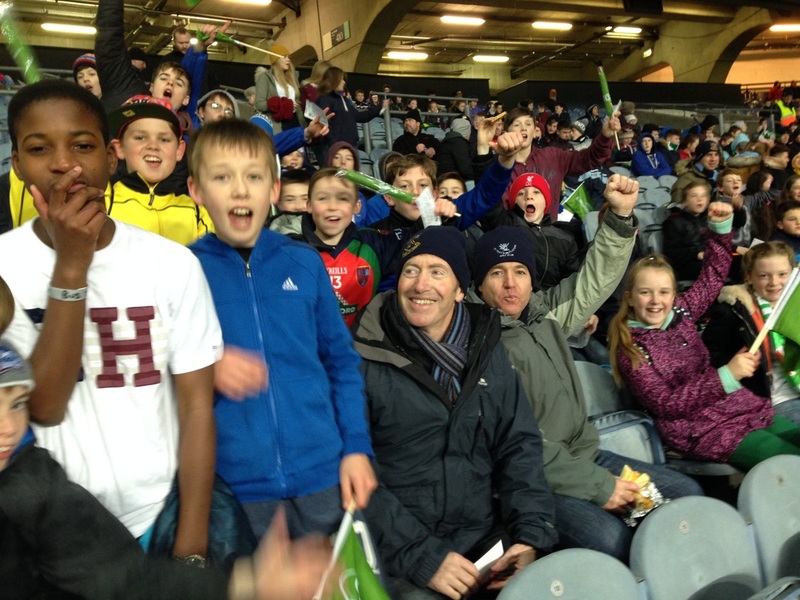 It was the 21st November and the school male and female Gaelic teams and other students went on a trip to Croke Park to watch the EirGrid Ireland V Australia International Rules match. It was a cold evening and we were met by two Mullens Buses at the bus bay outside the school at 4 o'clock and the bus left at 4:15 ‘sharp'. Some of us got on the bus earlier than others! We got to Julianstown and stopped outside the school and picked up some more people. Everyone was on the bus and we headed to the motorway. On the bus we all sang lots of songs and chatted and shouted. Someone took off their shoes and started throwing their socks at people. A lot of us brought phones and we were all taking photos and playing music. Eventually we got to Dublin. We were called off the bus by our groups. I was in Mr.Weir's group and we were all given green wristbands. We began our walk to the stadium and ten minutes later we were there. 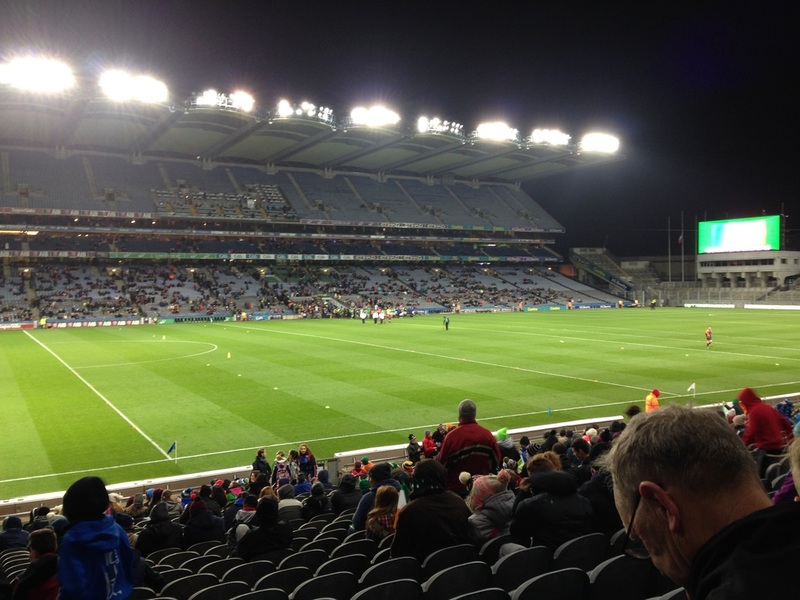 We were handed out tickets by our group leader and we walked through the turnstiles and headed to our seats in the Cusack Stand. When we arrived the Ireland Scotland Shinty International was coming to a finish. In the end Ireland won. Soon the main event kicked off. 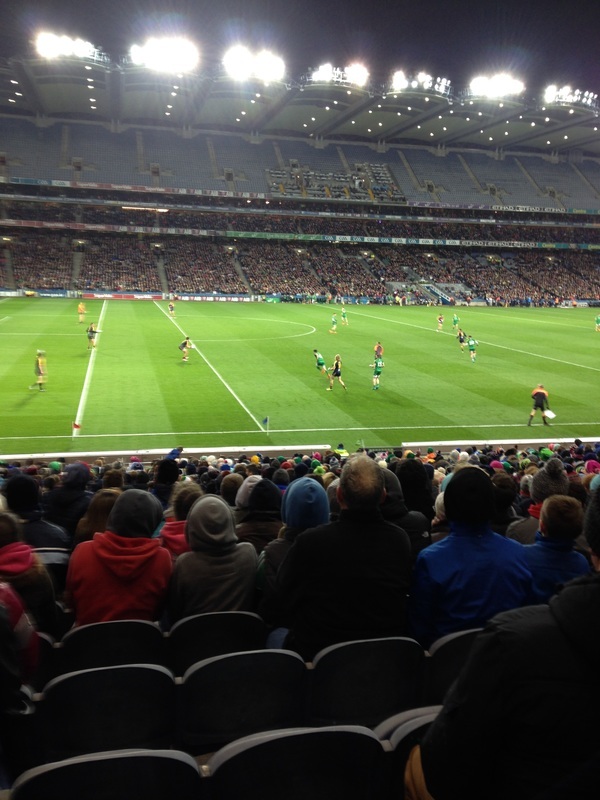 Ireland V Australia in the Cormac McAnallen cup. Early on on the game we dominated. 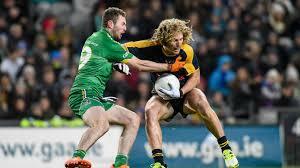 Aidan O'Shea scored two goals and Conor McManus scored 1. Brendan Brogan also scored quite a lot of overs.We went in at half time with a 43-23 lead and the Aussies failing to get a foothold in the game. During the breaks a lot of us went into the inside of the stadium to buy food and drinks and others went to stretch their legs and run around. Many people bought the €3 hot chocolate and other hot beverages and snacks. In the third quarter Australia struck back and rescued some points to win the quarter. In the last quarter Eddie Betts scored a goal and Robbie Gray hit an over to reduce our lead to just 3 points. It was intense and we were giving all we could to motivate the team by chanting songs and encouraging them with our support. Most of the 38,386 people in the huge stadium were on their feet. 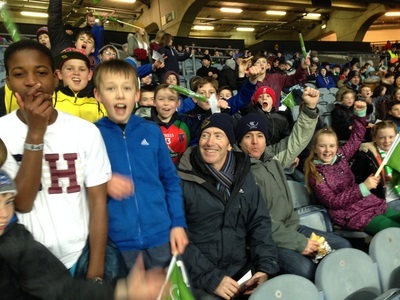 However the boys in green showed great team spirit to gain a point to put the game to bed. Every Ireland fan in the stadium roared, screamed and shouted as we gained the point. 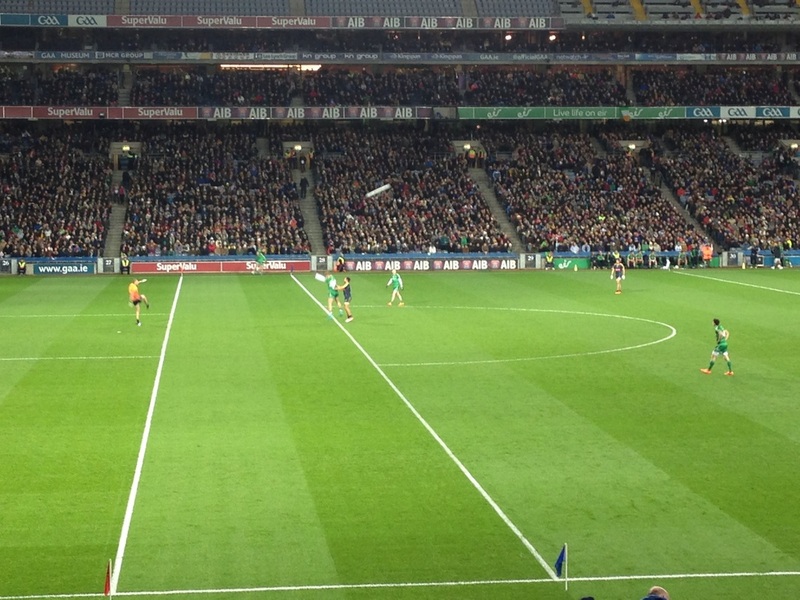 The game finished 56-52 and Ireland were the EirGrid International Rules champions! Joe Kernan's men celebrated on the pitch before lifting the trophy! 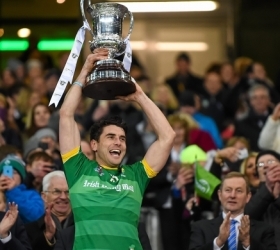 The Ireland and Dublin captain, Brendan Brogan gave a speech and that was that. After another long walk back we reached the bus and went to our seats. The bus was a lot quieter on the way back as everyone was tired after the long day. At ten past ten we pulled up outside the school.Just as we were about to leave the bus someone's food came back up. It made everyone get off the bus a lot faster! It was a great day! On behalf of everyone who went on the trip I would like to thank Mr.B.Kelly for organising the trip and Mr. Ward, Ms. McHugh, Ms. Shaw, Mr.R.Kelly, Mr.Weir, Niall Kelly (Wolfe Tones GFC) and Damian Hannon (St.Colmcilles GFC) for helping out. 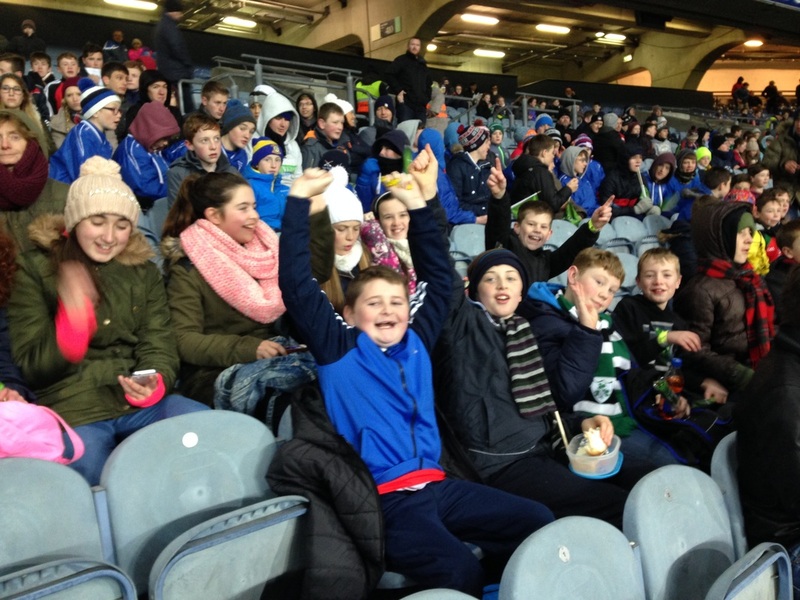 3rd Class Gaelic Teams do the school proud! 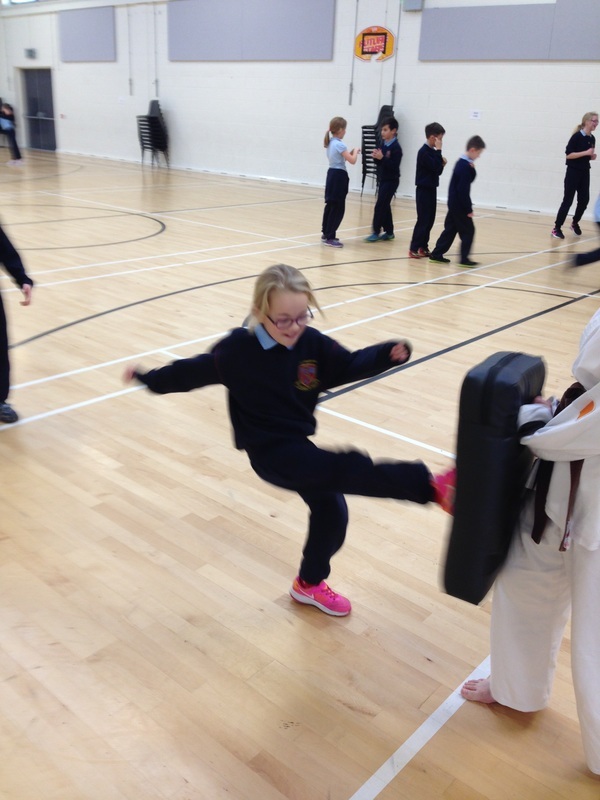 Our 3rd class boys' and girls' teams played their second match of the year on Friday 26th of November. Both teams played Gaelscoil An Bhradáin Feasa in two highly competitive matches. Considering the wet, cold and windy conditions great credit must go to both teams for delivering such an entertaining game. 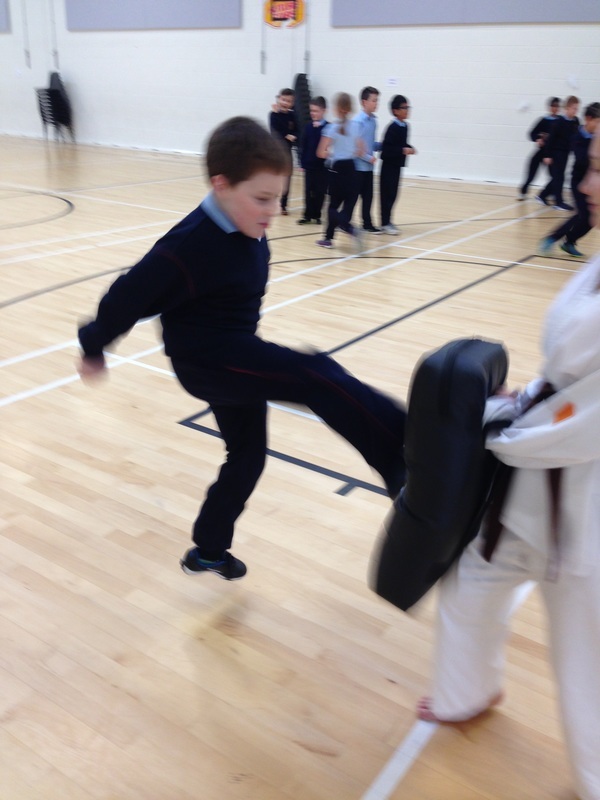 Some of the 3rd class had never tried Gaelic football before this year and many of them played their first game for the school on Friday. The two teams fielded players from diverse ethnic backgrounds such as Lativa, Poland, Romania and India! Scores are not kept in the 3rd Class league with the emphasis being on having fun, developing friendships and improving skills. In this regard all our 3rd class are winners!! 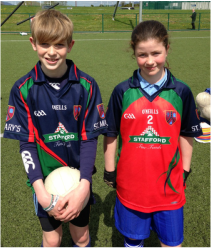 Special thanks senior players Oisin Murphy and Luke Hanan for refereeing on the day also. 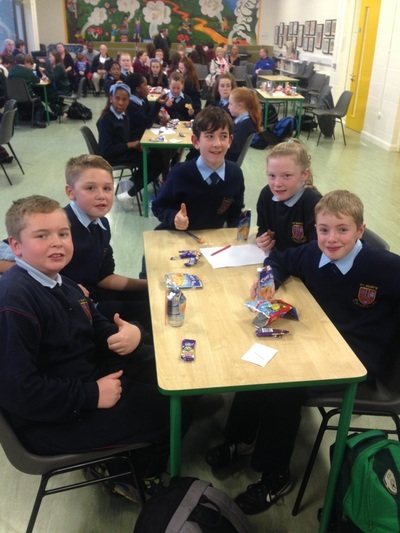 The school recently played host to the regional Cumann na mBunscoil quiz in Leabharlann Mhic an Ultaigh. 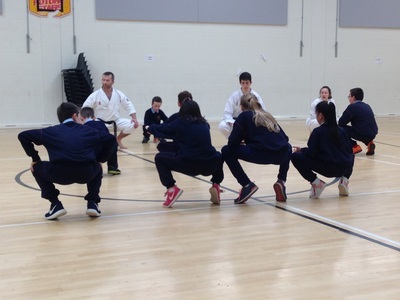 The school had two schools representing and altogether there were 12 schools from the Drogheda area. Although both our teams finished in the top five the eventual winners were St. Joseph's Boy's National School, closely followed (1 point!) 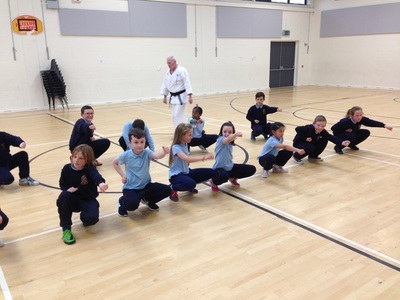 by Scoil Aonghusa. Both these teams will go on to the County Louth quiz in Knockbridge in the coming weeks! 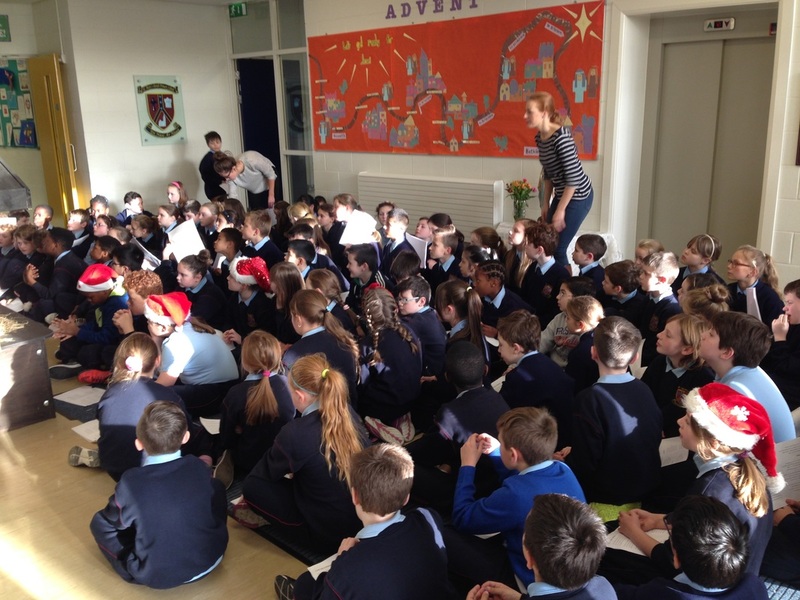 Thank you to Mr. Weir for organising the quiz and acting as quizmaster and Ms.McHugh and Mr.Kelly for correcting. 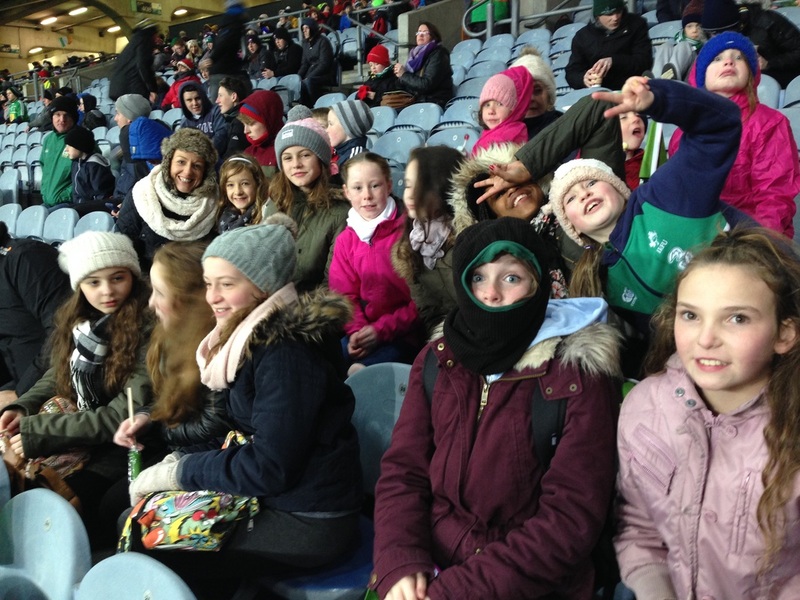 Our Girls' and Boys' Gaelic Football Teams along with many other 6th class students will attend Croke Park on Saturday, November 21st for the International Rules match between Ireland and Australia. 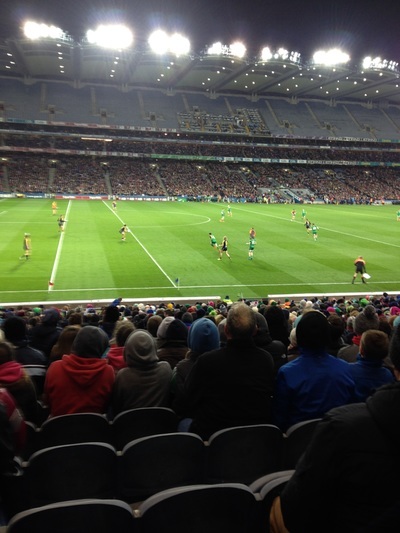 Hopefully some of our students will be back in Croke Park in a few years time to play against the Aussies! Check back here in a few weeks time to see a recount and photos of the day! SMPPS claim Cumann na mBunscol Mc Ardle Cup for the first time! St Mary’s made the better start to the 2nd half and added 1 02 in the opening 5 minutes, 1 01 from full forward Ryan Connolly with the point coming from Joe Cumiskey. However the Dundalk side were dangerous every time the attacked and could have had 3 goals over the next period but the close marking of the St Mary’s defence kept them at bay, a fine diving block from JJ Mc Donagh being one of the highlights while the excellent Killian Mc Laughlin carried the ball tirelessly out of the defence. St Oliver Plunketts could only manage 2 second half points and thus St Mary’s were comfortable winners in the end. This was a great team victory but worthy of special mention are Caolan Nulty , Cathal Monaghan, Killian Mc Laughlin, Callum Sheedy Daniel Reilly, Luke Hannan and Joe Cumiskey who were outstanding throughout the game. Subs: Liam Gaffney for Conor Nolan, Evan Fay for David Nkpa, Brandon Kennedy for Patrick O Connell, Shane Kelly for Oisín Murphy, Tiernan Rowley for JJ Mc Donagh. 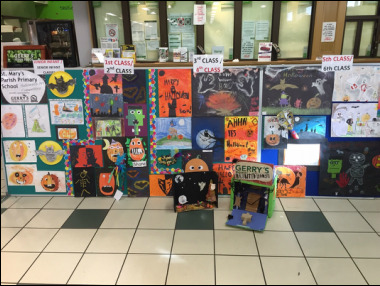 GERRY'S HALLOWEEN ART COMPETITION PROVES A WONDERFUL SUCCESS! 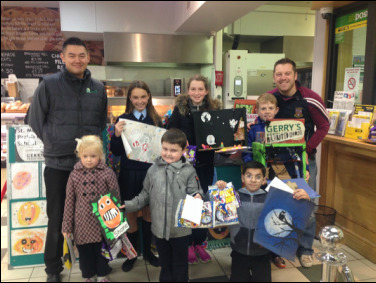 The results are in from our Halloween Art Competition proudly sponsored by Gerry's Fresh Foods next door! 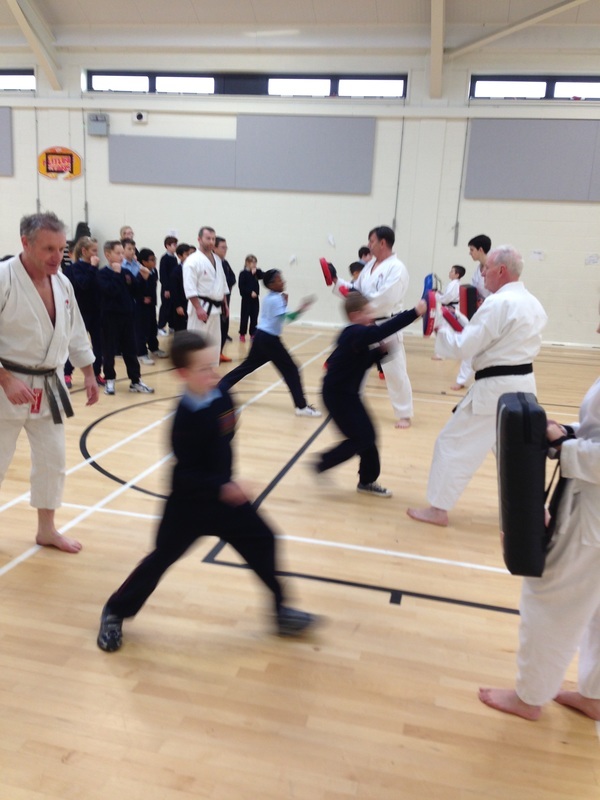 The standard was very high from all class levels and those displayed in the shop were enjoyed and commented on by students, parents, staff and customers alike. All the students whose work was displayed in the shop will receive a prize over the coming days with the winners in each category also receiving an Art & Hobby gift voucher! SMPPS would like to thank Gerry's Fresh Food for their genorosity and continued support. Check back here soon for details of our Christmas Art Competition!! 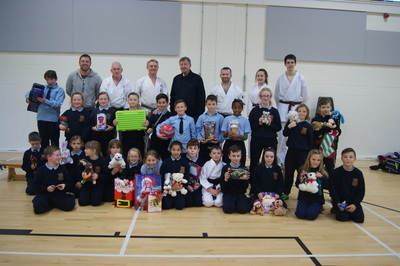 Pictured are the category winners with receiving their prizes from Gerry's Fresh Food employee Derek Zhao and teacher Brian Kelly. Congratulations to our Girls Senior Gaelic team on their victory in the Louth Cumann na mBunscol Oriel Cup beating Realt na Mara, Dundalk 2-08 to 1-04 in the final on Saturday. 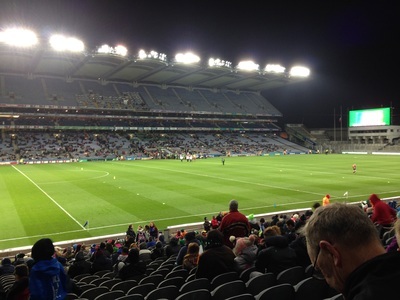 ​It's over to the boys now who play Blackrock in their final on Thursday evening (October 22nd) at 7pm. All support greatly appreciated. Match reports to follow! St. Mary's Claim Marian Cup! 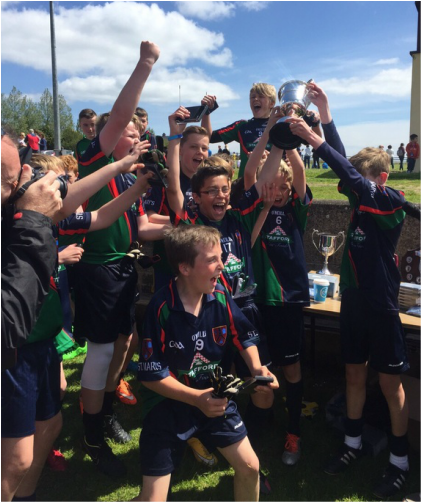 St. Mary's Parish Primary School got their hands on the Louth Marian Cup after holding off a dogged St. Joseph's CBS challenge at a sunny Stabannon on Saturday morning. St. Mary's got off to a flier of a start with a goal from Callum Sheedy inside the first minute which was quickly followed by a Ryan Connolly point and another goal from midfielder Jacob Kula. It looked like St. Mary's might run away with it in the early stages but St. Joseph's responded with a goal of their own and had it not been for some excellent defending from Sean Horan, Oisin Murphy and Killian McLoughlin it could have been more. It wasn't until Ryan Connolly scored a cracking goal to the right top corner of the net ten minutes from half time that St. Mary's really began to settle. This was followed by points from Liam Stafford, Luke Hanan, Joe Comisky and Dean Almond but again the Joes responded with two majors of their own to leave the scoreline at half time St. Mary's 4-06 St. Joseph's 3-00. Both sides were hoping to start well in the second half but like the first half it was St. Mary's who were quickest out of the blocks. Two early points were followed by a wonderful Joe Comisky goal who carved open the Joes defence and buried the ball to the roof of the net. However, instead of dropping their heads this seemed to kick St. Joseph's into life and they enjoyed their best period of the match scoring 1-04 in a ten minute period. With the game in melting pot St. Mary's were able to find an extra gear which saw them pull away in the final few minutes from their south side rivals. Points from Dean Almond, Luke Hanan (2), Conor Nolan and a magnificent long range effort from Liam Stafford saw St. Mary's run out winners on a scoreline of 5-15 to 4-04. 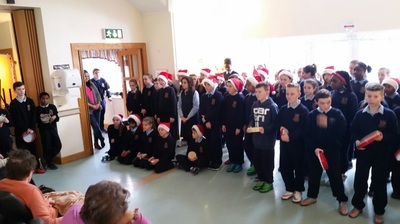 This was a great day for St. Mary's as it is the first bit of silver wear going back to Bryanstown since the school's opening in 2012. Great credit must go to the players and their clubs, especially Wolfe Tones and St.Colmcille's who provided the majority of team members. After the match joint captains Sean Horan and Liam Stafford accepted the Marian Cup on behalf of their school. St. Mary's team and scorers: Alex Curran, Killian McLoughlin, Shane Murphy, Caolan Nulty, Oisin Murphy, Sean Horan, Sean Flanagan, Liam Stafford (0-2), Jacob Kula (1-0), Ryan Connolly (1-1), Luke Hanan (0-6), Joe Comisky (1-3), Dean Almond (1-2), David Hobbs, Callum Sheedy (1-0), Michael Cunningham, Oran Rowley, Conor Shortt, Benamin Lactus, Conor Nolan (0-1), Daire O'Rourke, David O'Brien and JJ McDonagh. First class went outside to the garden. They pulled out lots of weeds then planted radishes and onions. The tulips are dying back into their bulbs. The strawberries are growing still. The violas are blooming. They put butterflies from Art Class in the garden too. 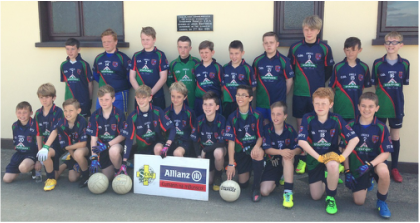 The boys’ Gaelic football team continued their good recent form with two victories either side of the weekend. These results see the boys qualify for the semi-finals of both the Marion Cup and the Cooney Cup. 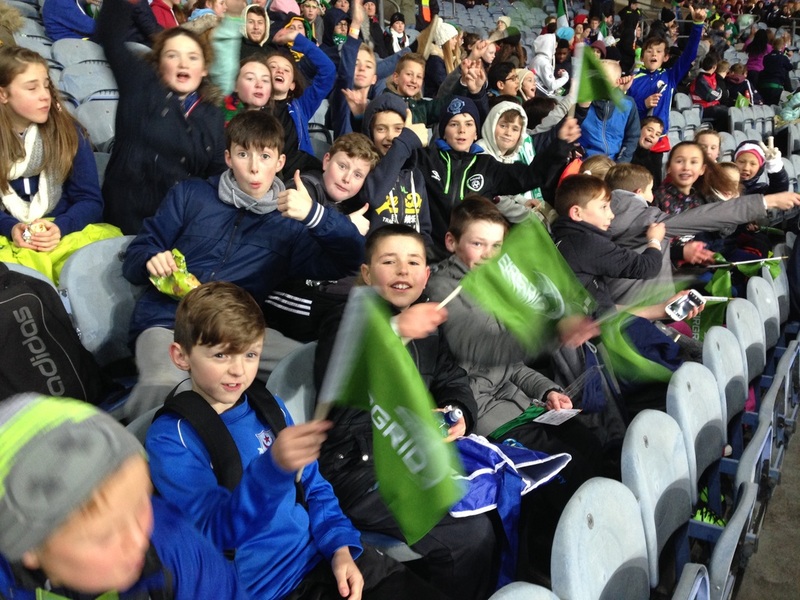 On Friday the boys played St. Malachy’s Dundalk in a repeat of the Cumman Na mBunscol final which the Dundalk side won by a single point just before Christmas. There was no repeat this time as the St. Mary’s lads put in their best performance of the year and ran out winners on a score line of 2-12 to 1-03. Although this was a team effort there were some exceptional individual performances not least from goalkeeper Alex Curran, defenders Sean Flanagan and Sean Horan and midfielders Jacob Kula and Liam Stafford. The boys now qualify to play Blackrock NS in the semi final of the Marion Cup on June 8th. After a break over the weekend the boys were back in action on Monday in their final group game of the Cooney Cup vs Le Ceile NS. With qualification assured management made some changes to the starting line up. 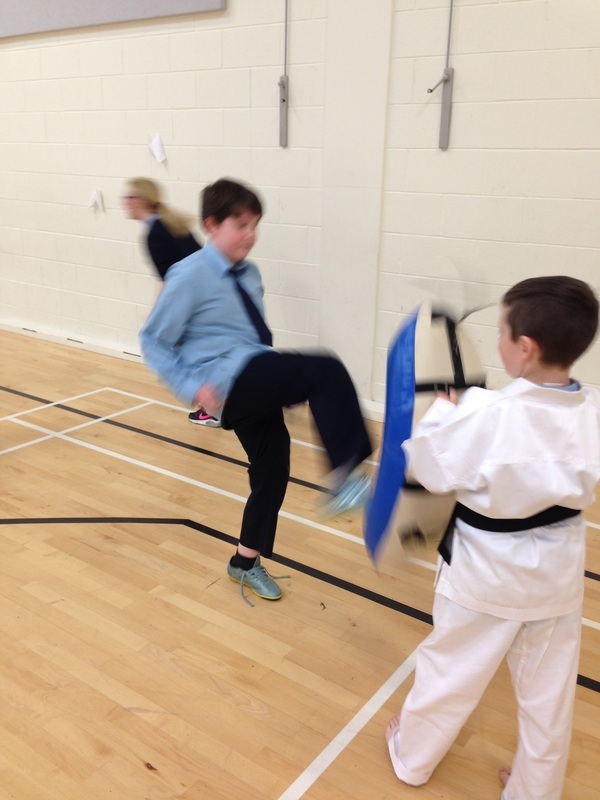 Those who came in really stepped up to the mark and have given Mr. Shaw and Mr.Kelly plenty to consider coming up to the semi-final vs Donacarney NS on Wednesday 20th in Piltown at 12:15. There were brilliant displays from Conor Shortt, Conor Nolan, Benamin Lactus, JJ McDonagh and Oran Rowley which helped St. Mary’s to a 2-13 to 3 points victory. The boys' gaelic team booked their spot in the Cooney Cup Semi-Final after an impressive away win against the current cup holders Duleek. St. Mary's playing with a slight breeze in the first half were quickest out of the blocks and an early Dean Almond goal helped to settle the nerves. This goal was all that seperated the sides during the opening quarter with both teams breaking even around the middle of field. It wasn't until Liam Stafford's long range effort deceived everyone and ended up in the back of the net that St. Mary's began to take control. Further points from Wolfe Tones men Jacob Kula, David Hobbs and Ryan Connolly left the score St.Mary's 2-06 Duleek 0-03 at half time. If St. Mary's were quickest out of the blocks in the 1st half the opposite could be said for the second with Duleek registering the first score of the half after just 10 seconds. This led to a purple patch for the home side and only for a series of wonderful saves from St. Mary's netminder Alex Curran things could have been a lot closer heading into the final quarter. As it turned out the St. Mary's boys seemed to find another gear and the impressive Dean Almond picked up his second 3 pointer of the game followed by five unanswered points evenly spread amongst the forwards. The introduction of St. Mary's subs helped to build on this lead as the tigerish defending of St. Colmcilles' David O'Brien and Oran Rowley and the pace of Benamin Lactus, Daire O'Rourke and Conor Nolan caused more headaches for the Duleek rearguard. It was fitting that the best score of the game was left until the end as an 'eye of the needle' pass from Luke Hanan found the tireless Joe Comisky in space. The Wolfe Tones man took on one defender and then rifled the ball to the roof of the Duleek net to leave the final score St. Mary's 4-16 Duleek 1-07. This was a great team performance but special mention must go to goal keeper Alex Curran and his defenders Killian McLoughlin, Shane Murphy, Sean Flanagan, Sean Horan and Oisin Murphy. The team have now qualified for the semi-final of the Merrion Cup and the Cooney Cup so check back here over the next couple of weeks for updates.